Good To Begin Well, Better To End Well: Postcards from Asgard, Available November 27th! 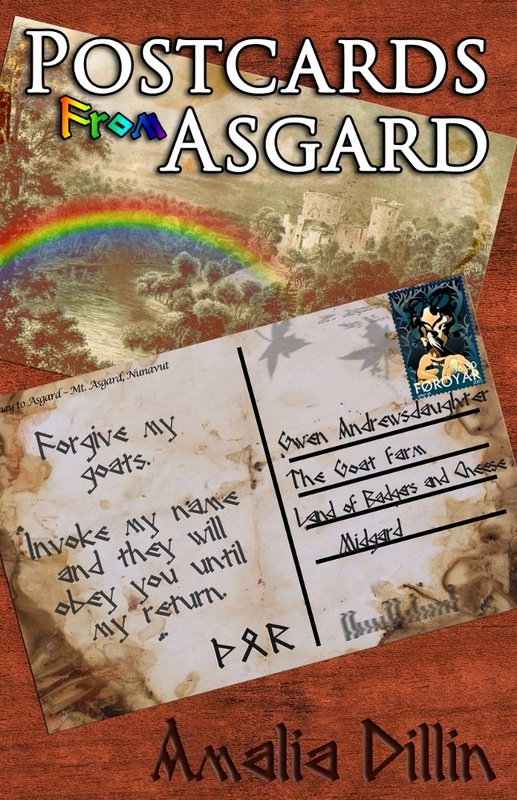 You've heard me talk about Postcards from Asgard off and on, and you've probably seen the cover below amongst my other books, for your goodreads additions (or subtractions I suppose!) -- well, I'm officially here to say that this paranormal romance novella will be live in paperback and ebook on November 27th! But you can pre-order it now for kindle and have it auto-delivered to your device for some delightful post-turkey pre-turkey-coma reading on Thanksgiving Day. Ordinarily, Gwen likes goats, even makes her living by milking them, but these two are some kind of devil-spawn, and one of them is pawing the ground, horns aimed at her gut. The fact that they were followed by a blonde farmhand with a much too charming smile isn't all that much of an improvement, either. But this so-called god who owns him? He's about to learn just how far a Midwestern girl will go to free the boy she loves. "In Postcards, Ms. Dillin takes an old myth and turns it into a beautiful contemporary love story. Gwen was strong and stubborn -- her reaction [...] was authentic, believable, and all together hysterical." And with this post, I officially declare the blog on HOLIDAY HIATUS! With the possible exception of Santa Theseus's arrival, with some news after Thanksgiving. Don't want to jump on the Santa bandwagon too soon, after all! See you in January blogfriends! And a Happy Holiday of every shape and style to you and yours in the meanwhile!